Wot? Does dat come wit macaroni salad? I saw this subject line in my list of email headers this morning. Being a kamaaina I thought, a SPAM™ dinner sounds good but who would be offering that? Then I saw the rest of the email. Only a local would get excited about free SPAM™ for dinner. Our company servers automatically tags some emails as possible spam mail. We have to get excited about Spam. We're certainly net getting Olive Garden or Red Lobster. 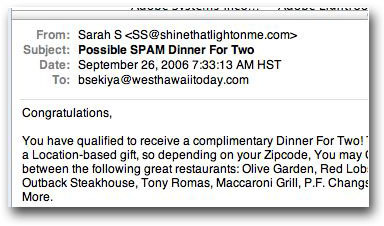 In Hawaii, this is not junk mail – this is a romantic proposition! Previous PostPrevious Nickel & diming their employees?